Has the Pro-Israel Lobby Hijacked the US Congress? 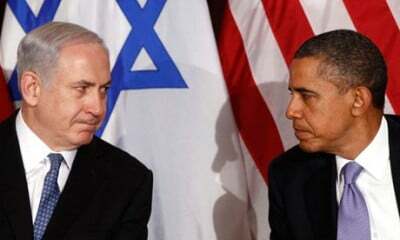 When US President Barack Obama and Israel’s Prime Minister Benyamin Netanyahu met the other day in Washington they tried to get along fairly well. The fundamental conflict between the US superpower and its political client state was watered down and rhetorically whitewashed. Obama has put up a brave front because he thinks of the day after leaving the White House and the election chances of Hillary Clinton. And Netanyahu was in great shape because he got all his wish fulfilled. A 50 % increase in subsidies, plus the most sophisticated warplanes in order to test them on the Palestinians and the neighboring countries such as Lebanon, Syria or Iran. For a foreign observer of US foreign policy, it’s elusive that a sassy leader of a teensy-weensy country who behaves like a political madman can push a US President around and gets amply rewarded for his sass. Just before Netanyahu set off for the US, his media adviser Ran Baratz called the President a “modern-day anti-Semite” and about Secretary of State John Kerry he wrote that he has the “intellectual acuity of a 12-year-old”. The political misery of the progressive institutions was demonstrated by the Centre for American Progress. The president Neera Tanden in her “conversation” with Netanyahu acted as a mere stooge. The audience was all convinced Zionists. Controversial opinions: None. The question arises; why can Netanyahu behave like a political desperado and gets away with it? In his new book, Kirk J. Beattie might give an answer. Stephen Walt and John Mearsheimer attributed the pro-Israel policy of the US administrations to the power and enormous influence of the Israel Lobby. Their approach has been criticized as too one-dimensional and simplistic. Beattie analyzes the power and influence of pro-Israel special interest groups in the US Congress systematically. There for, he conducted almost 200 interviews with congressional staffers, lobbyists, members of Congress, and foreign embassy officials over years in order to find out how Congress’ stance on the Arab-Israeli conflict. He investigated Congress’s role by examining the vetting of congressional candidates, financing of campaigns, congressional staffing, bipartisan alliances within the Senate and the House, and the agenda-driven allocation of foreign aid and policymaking. This approach has led to a fairly concrete and convincing picture of how the US congress acts in favor of Israel and other Middle Eastern countries. According to the author, the Israeli-Palestinian conflict serves as a backdrop to many conflicts in the area and of the perception of the US role in the world. US Congress makes the life for every US President very difficult when it comes to Israel. For Beattie, the Zionist Lobby doesn’t own Congress but has established a very strong present and plays a decisive role. Potential candidates for Congress have to show up, especially at right-wing pro-Israeli interest groups and pledge allegiance to Israel. Among these numerous lobby groups, AIPAC is the most influential politically and money wise. AIPAC out-guns all the other Zionist groups that bustle in this field. At every opportunity, AIPAC argues that Israel is the only democracy in the Middle East and the US shares the same values; that is why, the US should support Israel firmly. President Obama can’t do much because of strong opposition in Congress. He is between a rock and a hard place as the Iran issue has shown and the opportunity of his own party in the upcoming elections. The support of Israel in the US is especially strong among the evangelists. According to Beattie’s findings, this support is not reflected at the level of congressional stuff but rather on the elite level among the evangelists who wants to curry favor with the right-wing Israelis and they take advantage of this kowtowing. Despite his important and unique work on the insights of the workings of Congress’ Middle Eastern involvement, the author is anything but optimistic that a solution of the Arab-Israeli conflict is just around the corner. Due to the congressional machinations and Israel fixation, one understands now better why US Middle East policy stumbles and has been creating such a mess in the region. Kirk J. Beattie, Congress and the Shaping of the Middle East, Seven Stories Press, New York 2015, 320 pp.